This tour explores deformation of 2D mesh using Laplacian interpolation. 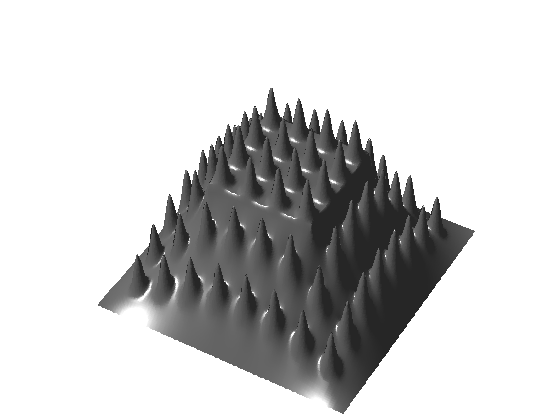 The dense deformation field is obtained from a sparse set of displaced anchor point by computing harmonic interpolation. You need to download the following files: signal toolbox, general toolbox and graph toolbox. You need to unzip these toolboxes in your working directory, so that you have toolbox_signal, toolbox_general and toolbox_graph in your directory. We create a simple mesh with fine scale details. We generate point on a square. We generate a triangulation of a square. Width and height of the bumps. 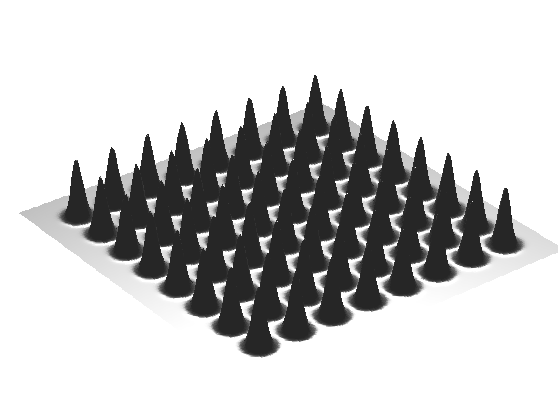 Elevate the surface using bumps. Compute the symmetric Laplacian matrix. We modify the domain by modifying its boundary. 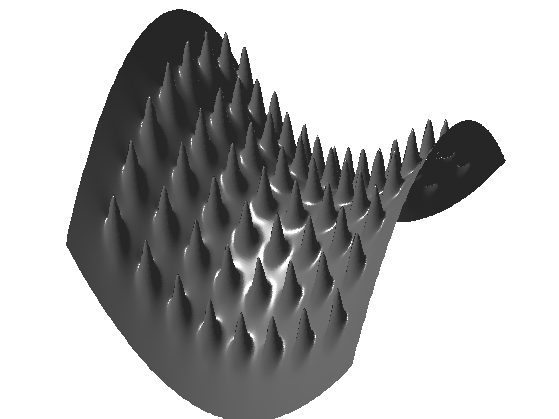 Compute the deformation field (zeros outsize the handle, proportional to the normal otherwise). 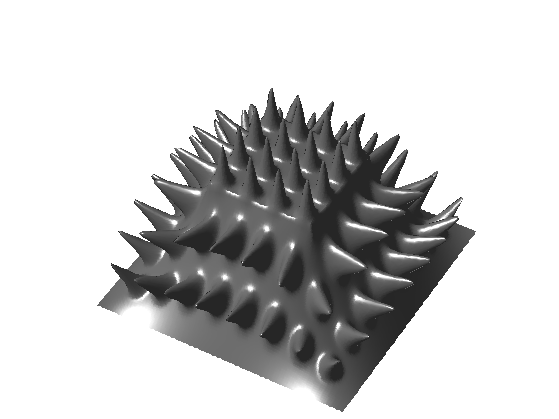 Modify the Laplacian to take into account the fixed handles. Compute the full deformation by solving for Laplacian=0 on each coordinate. Exercice 1: (check the solution) Perform a more complicated deformation of the boundary. Exercice 2: (check the solution) Move both the inside and the boundary. Exercice 3: (check the solution) Apply the mesh deformation method to a real mesh, with both large scale and fine scale details. Linear methods give poor results for large deformation. 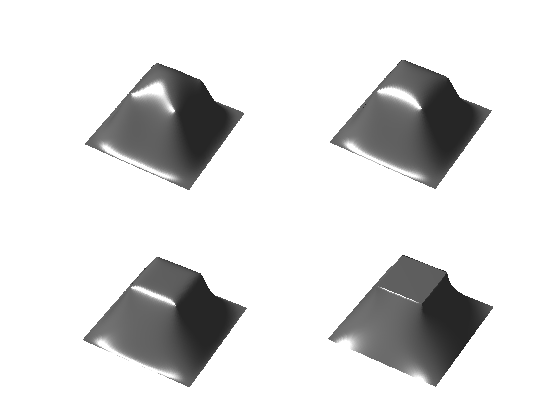 It is possible to obtain better result by applying the linear deformation only to a low pass version of the mesh (coarse scale modifications). The remaining details are then added in the direction of the normal, in a local frame that is rotated to match the deformation of the coarse surface. Exercice 4: (check the solution) Apply the deformation to the coarse mesh vertex0 to obtain vertex1. 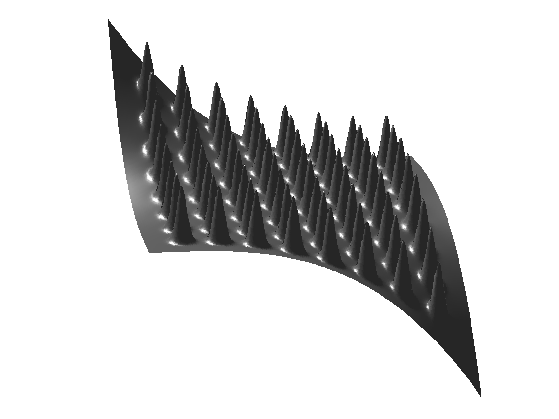 Important: you need to compute and use the cotan Laplacian of the coarse mesh, not of the original mesh! Compute the residual vector contribution along the normal (which is vertical). Exercice 5: (check the solution) Add the normal contribution d.*normal to vertex1, but after replacing the normal of vertex0 by the normal of vertex1. Exercice 6: (check the solution) Try on other surfaces. 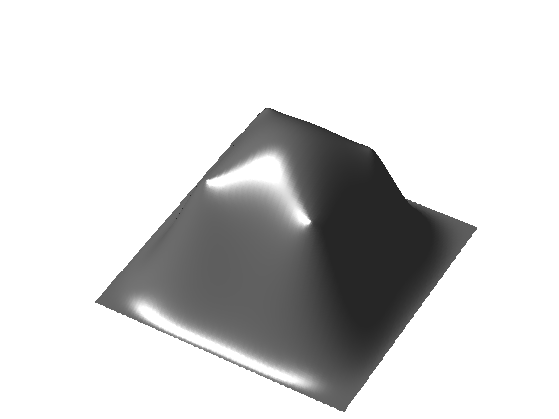 How can you compute vertex0 for an arbitrary surface ? To take into account the bending of the surface, one can use higher order derivative to interpolate the deformation field. The bi-laplacian LL corresponds to 4th order derivatives. It is the square of the Laplacian LL=L*L.
Exercice 7: (check the solution) Compute the bi-laplacian deformation of the coarse shape vertex0 by using LL instead of L. What do you observe ? Exercice 8: (check the solution) Compute the deformation obtained by moving from the Laplacian to the bi-laplacian, i.e. with t*L+(1-t)*LL for varying t.
Exercice 9: (check the solution) Apply the full model (Laplacian, bi-Laplacian and non-linear deformation) to the deformation of a complicated mesh.